Unit 1: Table of Contents (ToC). If you are ABSENT, look at the ToC to see if pages have been added. Also, look at the daily PowerPoint lesson below to help you. You are responsible for keeping your notebook up to date. Left-hand pages are ones that are student-thinking and this must be your own work. Right-hand pages are group or teacher-directed and can be photocopied using the class photocopier. You are an inventor and are devising a solution to the plastic pollution problem. You will create a model drawing of your idea to attract potential investors in the government or private sector. How can we engineer for good to help solve the plastic pollution problem? Teachers' Resources - See below. 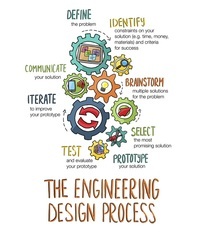 What are the steps an inventor or engineer takes during the design process? What are the Science and Engineering Practices (SEPs)? How do scientists determine the type of model (conceptual or physical) to use to explain an idea? How do engineers revise designs to improve them? ​​Plastic is a synthetic material, which means that it is not naturally occurring. The raw ingredients used to make plastics are fossil fuels. Fossil fuels were created by decaying plants and animals being exposed to heat and pressure over 300 millions of years - long before dinosaurs roamed the Earth. Some common fossil fuels are coal, oil, natural gas and petroleum. Fossil fuels are a nonrenewable resource, which means that once they are consumed they cannot be replaced. Fossil fuels are not biodegradable. This means that the plastic is not broken down into smaller pieces of materials that are usable by organisms. Pretty much every piece of plastic that has been made is still on the planet. Plastic is not truly recyclable. A recyclable material (ex. glass and metal) can be reformed infinitely into high quality materials with the same properties as the original material. Plastic is downcyclable, which means it can only be reformed once and then after that the material is trash. English Language Learners you only need to know words with the asterisk (*). Here is the ELL Support for Spanish and Portuguese. Design from KQED Public Radio. Day 5 (Aug. 29/30) - 6.1.0 - 5 Unit ToC, Unit Cover Page & Big Aha! Day 6 (Aug. 30/31 - Assembly Schedule) - 6.1.0 - 6 Phenomenon: Plastic Water Bottles & Students: Take this Pre-Unit Survey: Plastic Solutions in class. Day 10 (Sept. 10) What do the arrows mean? and Is my stuff sustainable? Day 16 (Sept. 21) .6.1.4- 4 Big Aha! This unit was created by KQED public media. This unit is now available at PBS Learning for free Some of the materials in this unit were adapted to work for use in Interactive Science Notebook. Here is a link the unit overview with changes I made. You are welcome to make comments on this document. I created the Zero Waste Challenge to empower the students as part of the unit. We are doing it in October as part of a national October Zero Waste Challenge movement we're starting; however, if October has passed do it whenever it works for you and your students.